Mexican archaeologists have discovered a 2,400-year-old burial site in which 10 skeletons were meticulously placed in a circular formation and with their body parts interlocked. The researchers have never seen anything like it, with signs pointing to a previously unknown ritualistic practice. This incredible discovery was made near the center of Tlalpan, a city just south of Mexico City. The ancient village associated with this grave was discovered back in 2006, and archaeologists with Mexico’s National Institute of Anthropology and History (INAH) have been conducting excavations in and around it ever since. The bodies were found about four feet beneath a building at the Pontifical University of Mexico, which used to house classrooms, a small chapel, and dorms for priests. Of the 10 bodies discovered in the grave, INAH archaeologists have confirmed the presence of two females, a male, a child, and an infant. At least two skeletons appear to have intentionally deformed skulls, and some have intentionally deformed teeth, according to a preliminary analysis. Clay pots and rounded bowls with tiny circular openings were also found at the site. Signs of cranial deformation among the remains of ancient Mesoamericans is nothing new—it was likely done to signify group affiliation, demonstrate social status, or as a cosmetic enhancement—but it’s the orientation of the bodies in the grave that’s particularly noteworthy. The skeletons were arranged in a spiral formation around a concentric point—as if to suggest the bodies were moving around a central figure like a wheel. Each body was placed on its side, and with arm bones interlocked. It’s not immediately clear if the people died from natural causes, some kind of group-wide calamity, or if they were deliberately killed. Though the exact purpose or reason for the grave is unknown, the researchers suspect it was part of an elaborate ritual. “We believe that it could be some interpretation of life, because individuals have different ages: There is a baby, a child, an infant, some young adults, adults, and an older adult,” said Rivera. This ancient Tlalpan village—one of the earliest settlements in the region—dates back to Mexico’s Pre-classical Period, which ran from about 1,000 BC to 250 AD. It was around long before the rise of the great Aztec Empire, which peaked between the 14th and 16th centuries. This particular village existed between the Ticoman phase (400-200 BC) and the Zacatenco phase (700 to 400 BC). Back then, the area featured a wooded area, fertile land, and waterfalls with fresh water. 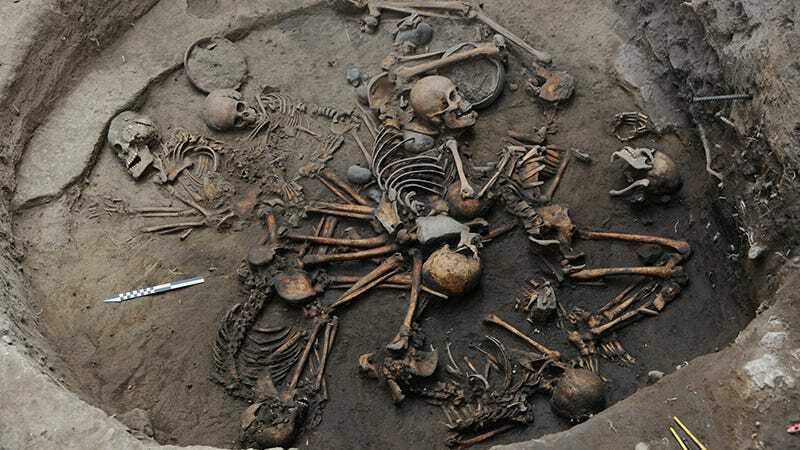 Archaeologists have found multiple Mesoamerican burials before, though with fewer bodies. The INAH archaeologists say they’re going to continue to study these bones and the artifacts to get a clearer picture of what happened.